Come on and slam, if you wanna jam. Welcome to the Space Jam! As some of you might know, we love game jams – they’re an amazing opportunity to learn new things, work with others, and consume a lot of sugar / caffeine (without too many regrets). 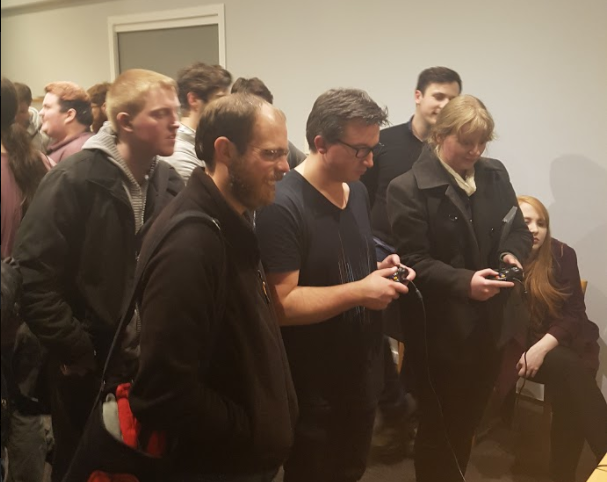 It had been a while since our last game jam, so we decided to run a small mini-jam of our own with Ben Evans and Alex Grace, a couple of our friends and fellow developers from the Tasmanian game development community. As with normal game jams, there is usually one overall theme that everyone has to work towards. However, as we were running this ourselves, each team gave the other a theme to work with. Our theme for Ben and Alex was “Unseen Enemies” – chosen unanimously from a bunch of good suggestions including ‘indirect interaction’, ‘the end is the beginning’, and ‘film noir’. In return, we got the theme “Destruction / Anti-construction” (ooh, time for explosions!). The main thing we wanted to get out of this jam was to learn new things, as well as trying to create something different than what we had made in the past. Our normal jam approach is to determine the atmosphere and feeling that we want to convey, and work on that (usually resulting in half-baked mechanics). For this jam however, we decided to put “mechanics first” and focus on creating a control scheme that felt good and was fun to play. Other things that we found interesting and were keen to look into were procedural generation methods and local co-op controls. So we then started the design process with these things in mind, we had an idea sorted after about two hours – which was much better than the full day it took for Politi-naps! The main thing we wanted to get out of this jam was to learn new things, as well as trying to create something different than what we had made in the past. 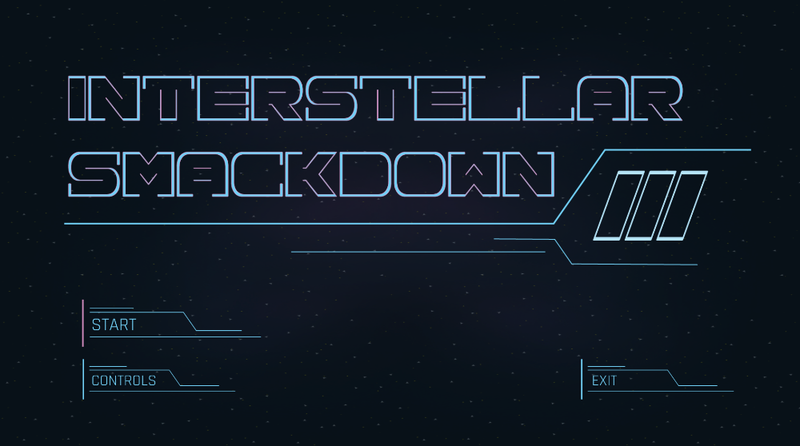 We then started developing components and art assets over the next 24 hours, resulting in Interstellar Smackdown 3 – a local co-op game where you attempt to bring down Earth’s colonising mothership. In order to destroy the mothership you have to work together in a pair to control three different spaceship systems: movement, shooting, and grappling of planets to hurl at the mothership. We wanted to force players to work together, hence the design of the three different necessary controls (with the players only able to control two at any one time). The planets that appear in the game were also procedurally generated, with different textures and movements. There were a number of challenges that we ran into: again, deciding on one idea that the entire team is happy with was pretty difficult, but we are getting better at knowing what we want to get out of a jam, and then emotionally detaching ourselves from that idea to just focus on our goals. We also found that the controller setup was a bit finicky across Windows / Mac – we had to end up just settling on Windows as we ran out of time. Another thing that we have little experience in – and want to improve on – is showcasing our games to others in the community. We tend to get wrapped up in all the little things that aren’t quite right and aren’t confident in showing something that we don’t think is good enough – so to combat this, we decided to demo our game at the next TasGDS meet-up in the week following the jam (eek!). We are happy we committed to that – everyone was amazingly positive about the game, and seeing smiles around the room was totally worth it. Seeing people getting enjoyment out of your game really reminds you why you’re making games in the first place. We are happy we committed to that – everyone was amazingly positive about the game, and seeing smiles around the room was totally worth it. Seeing people getting enjoyment out of your game really reminds you why you’re making games in the first place. Alex and Ben were kind enough to share some of the material they used in making their game ‘The Dimension Paradox’, which is a local multiplayer FPS with invisibility and laser guns!